Tod ay is exactly 2 weeks until the October 9th, 2018 Kentucky Voter Registration Deadline. It's also National Voter Registration Day. 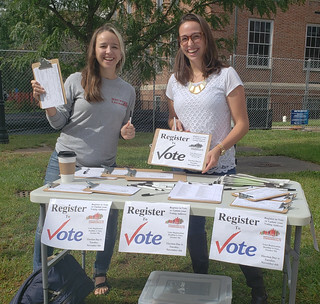 The Central Kentucky KFTC Chapter took that occasion to register 120 students on UK's campus at a loud and powerful voter registration table, spreading the word to make sure students know that they have the right to be registered locally, even if they're from far away. To register and vote in Kentucky, one needs to be at least 18 years old by Election Day (Tuesday, November 6), you have to live in Kentucky (temporary student housing works), and you have to be a U.S. citizen. Those are the basics, but things get a little trickier in Kentucky because our criminal justice system plays an unusual role in taking away people's right to vote. People with felonies in their past – Can't (generally) Vote. Kentucky disenfranchises people with felonies in their past and is harsher than almost any state in the US in that regard. People can request their rights be restored after they've served their time through this form, but few people know about the process and Governor Bevin denies many requests. People who have had their record expunged of felonies can also vote. KFTC's long-term goal is to change Kentucky's Constitution so that people get the right to vote back when they've served their debt to society including prison time, probation, and parole, but for now, this remains a barrier for over 312,000 Kentuckians. People with misdemeanors in their past – Can Vote! This disenfranchisement comes from section 145 of the Kentucky Constitution along with felony disenfranchisement. People serving probation and parole for a misdemeanor – Can Vote! Even though you're still serving your time, there's nothing stopping you from registering and voting in this case. People in jails pre-trial who were charged with either a felony or a misdemeanor – Can Vote! If you're in jail because you're awaiting trial or sentencing for any offense (and you've never been convicted of a felony), you do have the right to vote. That's a big deal, because in many Kentucky jails about 70% of the population is pre-trial. This week, a delegation of nearly 40 Appalachians from at least eight states – including eight KFTC members – are in Washington DC to meet with members of Congress and push for urgently needed legislation for a Just Transition for miners, their families and their communities. KFTC’s delegation, part of a larger group organized by the Alliance for Appalachia, has scheduled meetings with all eight members of Congress from Kentucky, including Senators McConnell and Paul, plus Representatives Jamie Comer, Brett Guthrie, John Yarmuth, Thomas Massie, Andy Barr, and Hal Rogers. The KFTC delegation includes three retired miners with black lung and five others who have close family members with the disease. KFTC member Joanne Hill explains why she has made the trip. “Also, everywhere we look in my area of Kentucky, we see the devastation that strip-mining has caused. Passing the RECLAIM Act is really important to put jobs back in our communities and make something good come out of all the destruction the coal companies left behind,” Hill said. a) A bill (not yet filed) to strengthen the solvency of the Black Lung Disability Trust Fund. b) The RECLAIM Act (H.R. 1731), sponsored by U.S. Rep. Hal Rogers, to create thousands of good reclamation jobs and support longer-term economic development initiatives. c) The American Miners Pension Act (H.R. 3913 / S. 1911), which ensures that the UMWA's 1974 Pension Plan can continue to pay pensions to retired miners and surviving spouses. The Benham City Council in Harlan County and Jackson City Council in Breathitt County are the first local governments in Kentucky to pass a local resolution calling on members of Congress to pass three bills needed to help sick, disabled, retired and unemployed coal workers and their families and communities. Benham’s city government took the unanimous action at its monthly meeting on September 13. Jackson's city government adopted the resolution one week later on September 20, 2018. Advocates hope other local governments may soon follow their example. A similar resolution was adopted several weeks ago in Virginia by the City of Big Stone Gap. Voter Registration Deadline is October 9. How can you help? Today is exactly 4 weeks until the October 9 Kentucky Voter Registration Deadline. 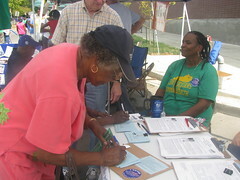 What are YOU doing to register voters and make sure people you know are all set to vote? Note that students who are away from home going to school have the right to either use a permanent home address or temporary local address as their voting address, but I encourage students to consider registering locally especially if home is far away (Election Day is a school day). Note also that 17 year-olds can register to vote now if they will by 18 on or before November 6, 2018. 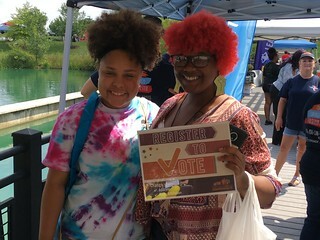 If you'd like to volunteer to register voters, please contact your local KFTC organizer to volunteer or to suggest an event to register voters. If you're outside of the area where a chapter is working, you can set up a voter registration drive of your own by reaching out to KFTC for training and materials. 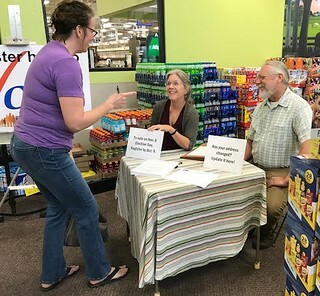 Tom Herrick and Laura Lee Cundiff (pictured below) recently put together a voter registration drive in Versailles, for example. 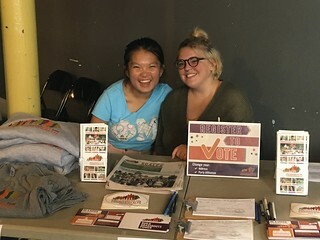 If you'd like to volunteer to set up your own voter registration event, please reach out to Dave Newton, Democracy Organizer at 859-420-8919 or Dave@kftc.org. Another way to get involved is to sign up for our Voter Engagement 101 Volunteer Training Online, with the next one on September 18. You'll learn how to register voters and why this is such a critical moment for voter empowerment work.